Hello Hello! June is turning out to be quite the busy month for me. I just finished a jam packed weekend, and now I’m gearing up for a little weekend getaway down to Galveston Island. Plans include seafood and lots of relaxation! This outfit is perfect timing because it’s pretty close to one of the outfit ideas I like to wear at the beach. 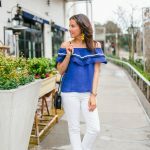 Beach vacations are all about comfort and effortless style, plus I like to throw in a little bit of chicness to the look too. Most island restaurants have a pretty casual dress code even for dinner. I still like to look a little polished with what I wear to dinner. 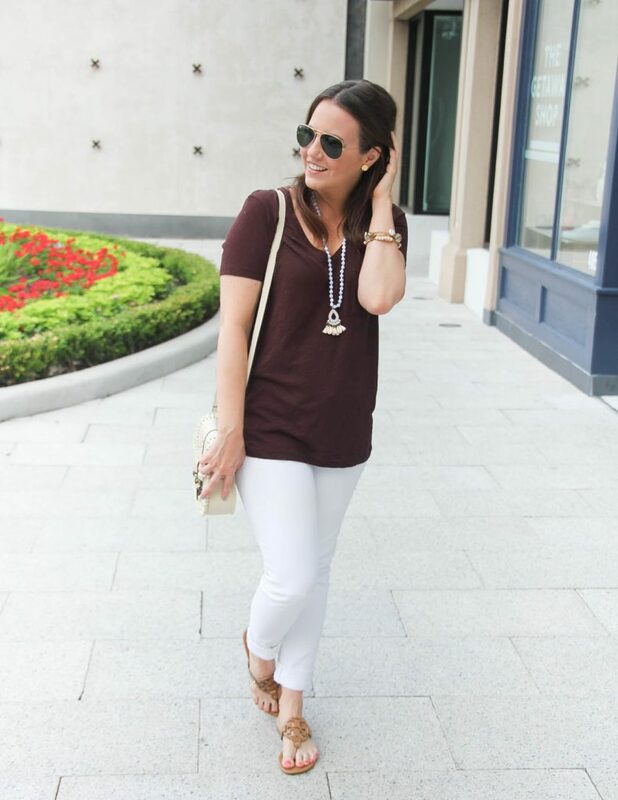 White jeans are a great item to pack for a slightly more dressy and polished evening outfit. 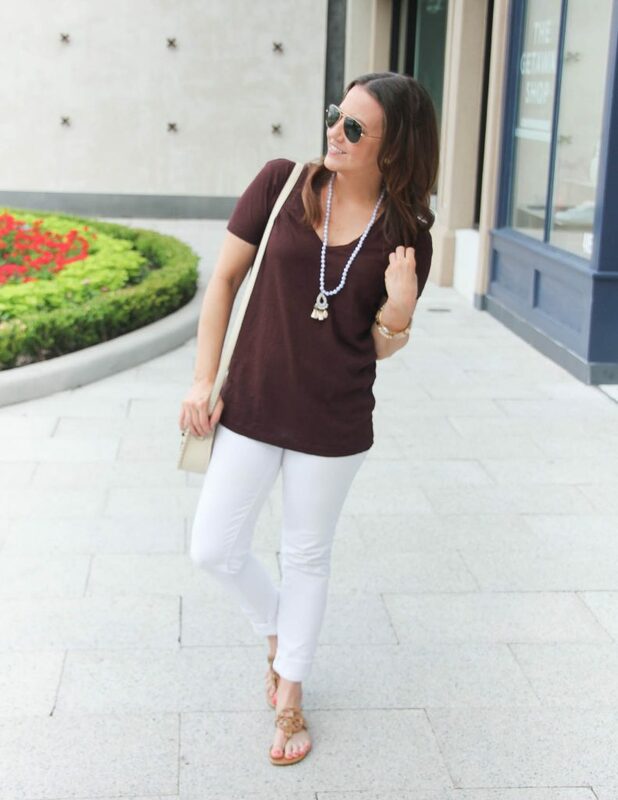 You can add in a few cute accessories like my shell necklace and create an easy and effortless dressy casual outfit. Weather and time pending, I hope to shoot a few more vacation outfit ideas while I’m down in Galveston, so stay tuned for those in the coming weeks. You can also check in on Instagram for a few snaps over the weekend. 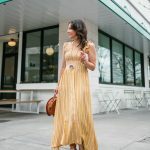 I hope ya’ll are having a fabulous week and don’t forget to scroll on down for more amazing outfit inspiration in today’s Style File Link Up! I really appreciate your style and how it can work for everyday wo.an without breaking the bank. Great outfit. That would be a perfect vacation outfit! I bet you can’t wait to have a break after being so busy! I love this look. So elegant and simple. Okay that necklace is amazing! I love the shells on it and it really takes center stage with that look! The perfect formula. I love that necklace too! It’s a real eye catcher and could be worn with just about anything. Darling! Yes, it really can!! I wear it way more than I thought I would originally. It’s become the perfect add on to most of my outfits. love the outfit!!!!! 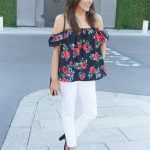 perfect summer outfit!! Love this look, the bag and sandals are so pretty! Love this casual look, chic and effortless. Gorgeous necklace. Fabulous casual look! I love the sandals! Such a pretty yet simple outfit, I love how put together you look without anything being too fussy! Perfect look for a beach vacation! I love the necklace and bag. Have fun on your trip and thanks for the link up!